WTI drops below $46 per barrel in post settlement after the API reported a surprise buildup in Crude stockpiles. The US oil continues to collapse towards a low of $45.77 during today's early session gearing up for another run to the downside. The decline appears to be driven by a combination of supply and growth concerns. Analysts from Danske bank noted that “the latter clearly also represents a supporting factor for the rally in global fixed income markets where the 10-year US Treasury yield declined 4bp yesterday to the lowest close since May at 2.807%, while the 10-year Japanese government bond yield has dropped to around 0.01% this morning”. As expected, Crude oil prices broke below the pattern presented on the chart and continue to print new lows this time at $45.77 per barrel. 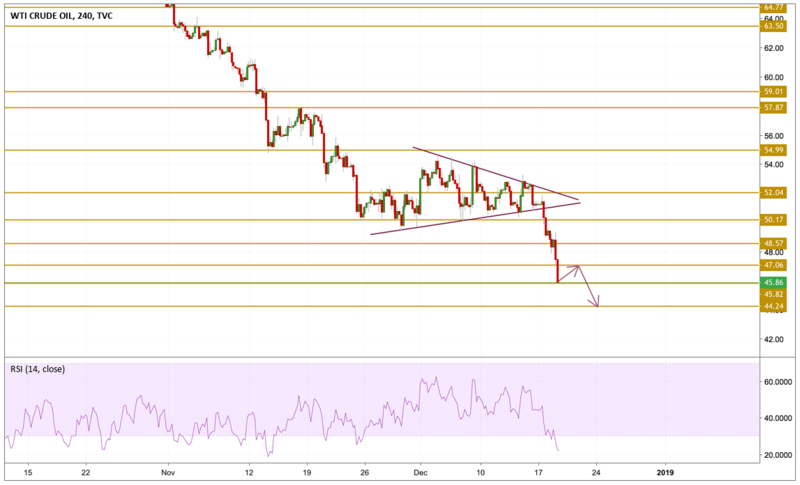 The price is currently testing the $45.82 support level with an extreme bearish momentum, however, an oversold state may push prices towards the near resistance level to ease the conditions before we see another downward move. The level we will be watching is the $44.24 support level.